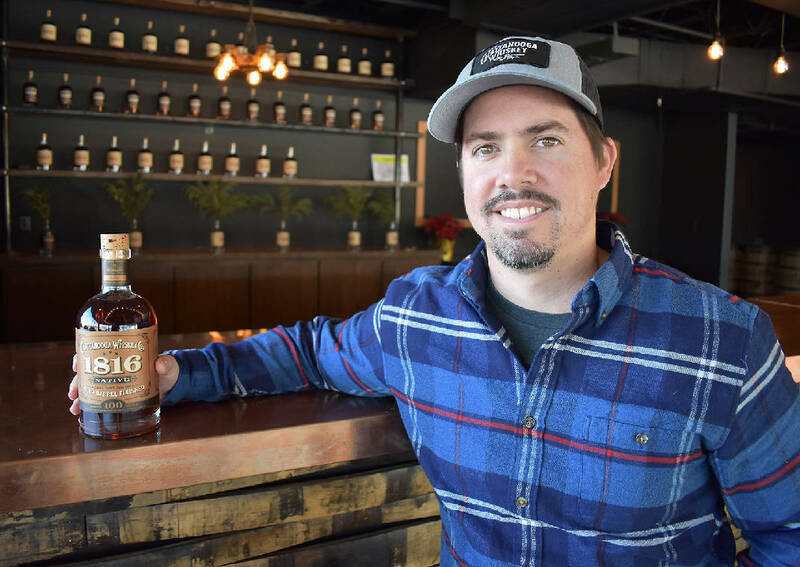 Tim Piersant, owner and co-founder of Tennessee Stillhouse, sits with a bottle of Native whiskey at the company's new distillery on Riverfront Parkway. Bottles are for sale at the micro-distillery on Market Street and in some local liquor stores. As Tim Piersant puts it, you can't make great whiskey without first making great beer. It was from this mindset that the 1816 Native series from Chattanooga Whiskey Company was born. Piersant, owner and co-founder of Tennessee Stillhouse, calls the beer-barrel-finished whiskeys one of the "coolest" community collaborations the company has done since opening its doors in 2011. The series is the perfect example of how the whiskey and beer community in Chattanooga is more collaborative than competitive, he says, and it illustrates how his company likes to challenge the status quo. "One of our internal philosophies is rules are good so change them," says Piersant. "We don't want to throw away tradition for the sake of being different, but we want to expand upon it and push the envelope. Native was bred from that philosophy." Each of the seven whiskeys in the series was aged in Chattanooga Whiskey barrels after seven breweries — six of which are local — aged and created their own unique beers in them. "We want beer-drinkers to drink whiskey and whiskey-drinkers to drink beer," Piersant says. "It's about education and growing the consumer base." Released this fall, the Native series will be an annual project, with the distillery giving barrels to local breweries at the beginning of the year so they can begin aging the beer. According to Piersant, whiskey takes on the flavor of beer quickly, but beer takes a bit longer to absorb the whiskey. After the barrels are back in the hands of Grant McCracken, head distiller for Tennessee Stillhouse, the company's 1816 bourbon will age in the barrels for two or three months on average, being released in the fall, Piersant explains. The Native series is a limited release, so bottles from this past fall may be numbered. Locals can snag remaining bottles at the Tennessee Stillhouse micro-distillery on Market Street and in local liquor stores. The average retail price is between $50 and $60 — a good price for a top-shelf bourbon, Piersant says. The beers may be harder to come by. The breweries released their beers at different times throughout last year, so it's possible they might not be available on tap anymore. 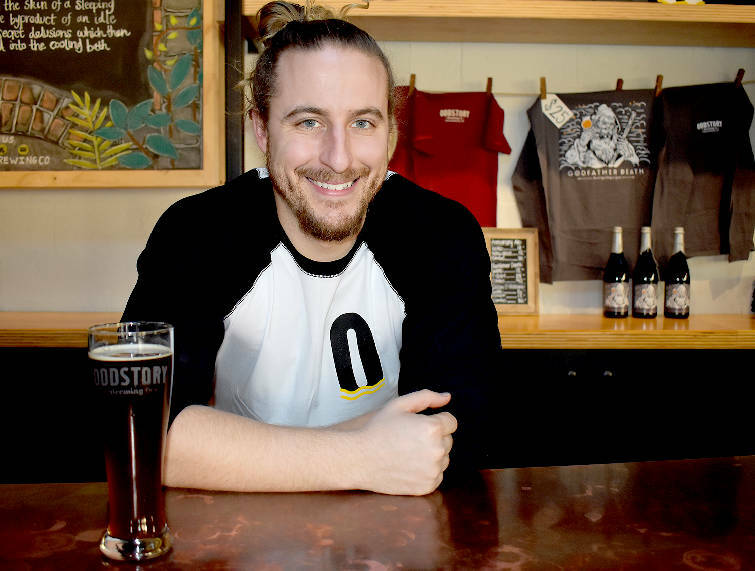 The Native series with Chattanooga Whiskey and several other local breweries was OddStory's first collaboration, says owner and head brewer Jay Boyd. The result was "Godfather Death," a spiced Belgian quad. Bottles, pictured at right, are still for sale at the brewery. OddStory Brewing Company still has bottles of its brew, called "Godfather Death," available for purchase. Jay Boyd, OddStory head brewer and owner, describes the spiced Belgian quad as fruity in nature. It includes orange peel and vanilla bean to help bring out the whiskey taste, he says. Aged for six months in the whiskey barrels, it was released on Halloween. The brewery recently did another collaboration outside of the Native series with Chattanooga Whiskey, and the end product is a barrel-aged smoked doppelbock now available on tap. So, what kind of drinker would like Native whiskey? Of course, the bourbon-drinker, Piersant says. Also, the whiskey-enthusiast who is adventurous will love Native because of its complexity. "The point is to get the beer enthusiasts to try a good whiskey and to discover a love for whiskey," he says. "What better way to do that than to give them something that has been aged with their favorite beer?"